According to a new market report “Bioinformatics Market – Global Industry Size, Market Share, Trends, Analysis and Forecast, 2012 – 2018,” published by Transparency Market Research, the global bioinformatics market is estimated to reach market size worth USD 9.1 Billion in 2018. The market is forecasted to record double digit growth, with highest revenue contribution from the bioinformatics platforms segment. The global bioinformatics market, estimated at USD 2.3 billion in 2012 is forecasted to reach a market size of USD 9.1 billion in 2018, at a CAGR of 25.4% from 2012 – 2018. The market growth is driven by rise in applications across various industries. The key contribution to the market demand is from fields such as agriculture biotechnology, pharmaceutical research and development, medical and clinical diagnostics, and other life-sciences related industries. The bioinformatics platform holds the largest market share and is estimated to account for nearly 50% of the market revenue. The services market currently holds a relatively smaller market share, however is expected to increase considerably over the forecast period. The bioinformatics platform segment is the fastest growing market and is expected to contribute 54% of the total market growth during the same period. The demand across genomics and wide application in the medical and biological information sector is driving the demand for bioinformatics platforms and services in the global market. The research outsourcing by pharmaceutical giants in the fields involving bioinformatics content is a significant driver of the global bioinformatics market. These companies in efforts to reduce time and cost on R&D activities involved in the development of novel drugs and new applications for existing drugs, are looking for outsourcing services for bioinformatics knowledge and management tools, platforms, and services. Among the regional markets, North America holds the largest share; however, is forecasted to be succeeded by Europe as the leading market share holder in 2018, due to fast growth shown by major European markets such as Germany and U.K. Europe is forecasted to be the fastest growing region, with growth mainly driven by rising government support for R&D activities in the region. The bioinformatics services market in Europe and North America is well developed and organized whereas it is still in initial growth stage in emerging markets of Asia Pacific region. The report analyzes the global bioinformatics market growth across various segments such as knowledge management tools, platforms, and services. The in-depth analysis includes analysis of sub-segments up to three levels, with cross sectional analysis on the basis of geographical and regional market size and forecasts. The cross-sectional analysis of the global bioinformatics market based on applications further provides market growth potential across various end user industries. The segments considered on the basis of application are – molecular medicine, gene therapy, drug development and preventive medicine. The report also provides comparative analysis of various features such as performance, scalability, reliability, brand, and others, which have impact on the market and key player strategies. The trends affecting the market dynamics such as academic research, government policies and developments in the biotechnology and agricultural fields, too are shared in the report for futuristic planning and data forecasting. Influence of key –omics areas on the bioinformatics market, driving market growth are also analyzed in the report. The company profiles of key players in the market, their business strategies and financial performance is also shared. The report provides a holistic assessment of the global bioinformatics market by segmenting it based on different parameters and analyzing winning strategies followed by stakeholders for every segment. According to a new market report published by Transparency Market Research “Fish Oil Market for Aquaculture, Direct Human Consumption, Hydrogenation and Industrial Applications – Global Industry Analysis, Size, Share, Growth, Trends and Forecast, 2012 – 2018,” the global market forfish oil was valued at USD 1.1 billion in 2011 and is expected to reach USD 1.7 billion in 2018, growing at a CAGR of 5.05% from 2012 to 2018. In terms of volume, the demand for fish oil was 1,035 kilo tons in 2011 and is expected to reach 1,130 kilo tons in 2018, growing at a CAGR of 1.22% from 2012 to 2018. The demand for fish oil is expected to increase owing to the increased demand for omega 3 ingredients. Fish oil is the primary source of omega 3 and with the growing awareness of omega 3 and its benefits; consumers are increasing their intake of omega 3 as part of regular diet. However, the reduced or static production levels of fish oil acts as a major inhibitor for the growth of the market. This situation is expected to escalate due to the uneven frequency of El Nino, which further reduces the overall fishing volumes. Aquaculture was the largest application segment in 2011, accounting for over 70% of the consumption of oil. Majority of fish oil is consumed in the farming of salmons and trout, which are primarily grown in Chile and Peru. However, direct human consumption (DHC) of fish oil has been increasing over the past five years due to increased awareness among customers regarding the benefits of omega 3. Europe was the largest consumer of fish oil in 2011, with over 450 kilo tons of oil consumed. Asia Pacific and Latin America are expected to be the fastest growing regions in terms of fish oilconsumption due to growing aquaculture for carps in China and salmon farms in Chile. The leading fish oil producers include EPAX AS, Croda Inc, COPEINCA ASA, Corpesca S.A and Omega Protein Corporation among others. The report contains company profiles of the above mentioned producers along with other major players in the fish oil market. The fish oil market includes fish oil obtained from fishing as well as aquaculture. In terms of application, this report analysis the primary uses of fish oil such as aquaculture, direct human consumption (DHC) and industrial. Peru, Chile and Denmark were the leading producers of fish oil and account for over 50% of production. In terms of consumption, the European region was the largest consumer primarily due to the farming of salmons and trout. The report comprises a detailed description on the forecast and analysis of the fish oil market on a global level. The forecasted demand is based on volumes (kilo tons) and revenue (USD million) for the period ranging from 2012 to 2018. The study consists of drivers and restraints of the fish oil market and their impact on the growth of the market within the forecast period. In addition, the study includes opportunities available for the fish oil market on a global level. For better understanding of the fish oil market, we have given a detailed analysis of the value chain. In addition, a comprehensive study of the Porters five forces model has been provided for better understanding of the intensity of competition present in the fish oil market. Furthermore, the study comprises a market attractiveness analysis, where the applications are benchmarked based on their market size, growth rate and general attractiveness. According to a new market report published by Transparency Market Research “Pet Food Market – Global Industry Size, Market Share, Trends, Analysis and Forecast, 2011 – 2017,” the global pet food market was worth USD 58.6 billion in 2011 and is expected to reach the value of USD 74.8 billion in 2017, growing at a CAGR of 4.2% from 2011 to 2017. North America is expected to remain the largest regional segment for the pet food industry in terms of revenue generation, accounting for around 40% of the total revenue. Asia Pacific will be the fastest growing segment due to growing trend and increasing importance of pets in homes. North America market for pet foods was valued at USD 21.7 billion in 2011 and expected to witness growth in 2012 and reach the value of USD 22.4 billion. With number of market drivers and product innovations in pet foods, the North America pet foods market is forecasted to reach USD 26.6 billion in 2017 at the CAGR of 3.5% from 2011 to 2017. Europe market being the second largest consumer of pet foods is expected to grow at a CAGR of 4.4% from 2011 to 2017. This report is an effort to identify factors, which will be the driving force behind the animal feed and feed additives market and sub-markets in the next few years. The report provides extensive analysis of the industry, current market trends, industry drivers and challenges for better understanding of the market structure. The report has segregated the animal feed additives industry in terms of products, livestock and geography. We have used a combination of primary and secondary research to arrive at the market estimates, market shares and trends. We have adopted bottom up model to derive market size of the global animal feed and feed additives market and further validated numbers with the key market participants and C-level executives. This research is specially designed to estimate and analyze the demand and performance of animal feed additives products in global scenario. This research provides in-depth analysis of animal feed additives product manufacturers, product sales, trend analysis by segments and demand by geography. The report covers all the major product segments of the global animal feed additives market and provides in-depth analysis, historical data and statistically refined forecast for the segments covered. This report is an effort to identify factors, which will be the driving force behind the array market and sub-markets in the next few years. The report provides extensive analysis of the industry, current market trends, industry drivers and challenges for better understanding of the market structure. The report has segregated the array industry in terms of product, application and geography. This research is specially designed to estimate and analyze the demand and performance of array instruments in a global scenario. The research provides in-depth analysis of array product manufacturers, product sales, trend analysis by segments and demand by geography. The report covers all the major product segments of the global array market and provides historical data and statistically refined forecast for the segments covered. Technological advancement and sophisticated approach in health care operations are the major factors contributing the development of array instruments market. Some of the major factors affecting the global array market include increasing number of chronic diseases, innovation in health care operations, cost effective drugs development, and requirement of reduced clinical trials failure in drug development and support from the government to improve overall health infrastructure facilities. DNA micro array represents the largest market segment at USD 861.8 million in 2011 of the overall array market, followed by the protein array technology. DNA array technology is expected to grow at a CAGR of 12.1% from 2011 to 2017. In 2011, the current market share of protein array was about 31.7% and which is expected to capture 37.2% of the market share in 2017. Current array market is dominated by the U.S and Europe at 40.1% and 33.2% market share respectively. Asia Pacific market is growing at the highest growth rate because of high demand from emerging countries like India and China. Asia holds the market share of 21% in array market and generated the revenue of USD 307.8 million in year 2011. This report is an effort to identify factors, which will be the driving force behind the baby care market and sub-markets in the next few years.The report provides extensive analysis of the baby care industry, current market trends, industry drivers and challenges for better understanding of the babycare market structure. The report has segregated the baby care industry in terms of products and geography. We have used a combination of primary and secondary research to arrive at the market estimates, market shares and trends. We have adopted bottom up model to derive market size of the global baby care market and further validated numbers with the key market participants and C-level executives. This research is specially designed to estimate and analyze the demand and performance of baby care products in global scenario. This research provides in-depth analysis of baby care product manufacturers, product sales, trend analysis by segments, and demand by geography. The report covers all the major product segments of the global baby care market and provides in-depth analysis, historical data and statistically refined forecast for the segments covered. According to a new market report published by Transparency Market Research “Baby Care Products Market – Global Industry Analysis, Market Size, Share, Growth and Forecast 2007 – 2017”, Global baby care product market was worth USD 44.7 billion in 2011 and will reach USD 47.7 billion in 2012 and is further expected to reach USD 66.8 billion in 2017, growing at a CAGR of 7.0% from 2012 to 2017. In the overall global market, EMEA region is expected to maintain its lead position in terms of revenue till 2017. EMEA is expected to enjoy 34.7% of global baby care market revenue share in 2017 followed by Asia-Pacific. According to a new market report published by Transparency Market Research “Pharmacy Automation Systems Market – Global Industry Analysis, Size, Share, Growth, Trends and Forecast, 2012 – 2018,” the pharmacy automation systems market was valued at USD 4.7 billion in 2011 globally and is expected to grow to USD 7.8 billion by 2018, at a CAGR of 7.3% from 2012 to 2018. Automated technologies in pharmacy operations results in fewer medication errors, reduced medication cost, faster delivery time and enhanced control over pharmacy inventory. These benefits are expected to drive growth throughout the forecast period. In addition, market growth is expected to accelerate due to increasing cost pressure on healthcare providers from mounting regulatory guidelines, rising number of dosage prescriptions and reducing medical reimbursements. In 2011, the automated medication dispensing systems segment held the largest share in the global pharmacy automation systems market accounting for 48.3% and valued at USD 2.3 billion. The segment is expected to reach USD 3.6 billion by 2018 at a CAGR of 6.7% from 2012 to 2018. Shifting trend from centralized to decentralized or hybrid hospital pharmacy in large sized hospitals to improve the medication distribution process and patient safety is accelerating the demand for these systems. However, reluctance to accept these systems is seen in emerging markets due to its high deployment cost. The majority of revenue is generated through hospital pharmacies particularly from large sized hospitals with more than 400 beds. Low budget restrains the expenditure of small and mid-sized hospitals to invest in expensive systems. Nevertheless, increasing investment is seen from these hospitals and pharmacists in affordable technologies such as tablet counters and compounding machines. The market is foreseeing considerable expansion due to growth in retail pharmacies and drug store chains in emerging countries with the introduction of FDI in these regions. The report also includes strategies and market entry barriers to be considered by individuals and groups who expect to venture into this arena in the coming years. Additionally, the report also includes recommendations for new entrants as well as seasoned players in the market based on current trends, and expected future market trends. To aid in tactical decision making, the report provides competitive profiling of key players, business strategies adopted by them and recent developments in the industry. This study will help suppliers, designers, manufacturers and distributors in the pharmacy automation technologies field to plan and implement their strategies in potential markets and new technologies. 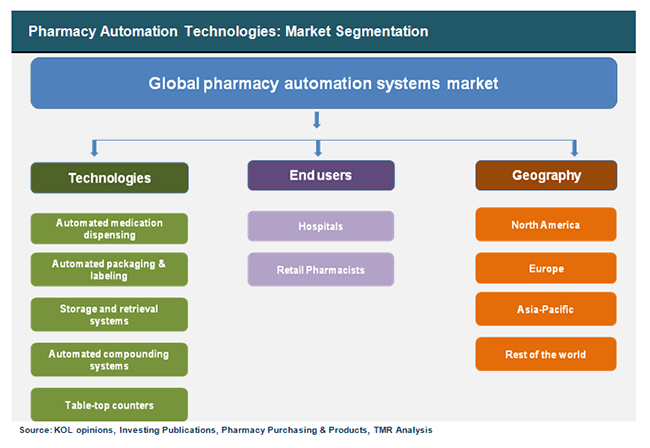 The report segments the pharmacy automation systems market by technologies into automated medication dispensing, automated packaging and labeling, storage and retrieval systems, automated compounding systems and table-top tablet counters. According to major end users, this market is segmented into automation in hospital pharmacies and automation in retail pharmacies. The report also provides an in-depth analysis of current trends, drivers and outlook by geography in the final section.